NEW YORK – Sept. 11, 2017 – PRLog — After successfully launching in Europe, MAGICSTRIPES has announced its expansion onto the North American market. 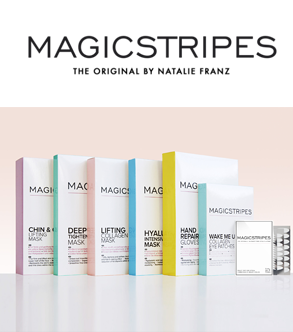 MAGICSTRIPES is one of Europe’s emerging skincare brands, due to its effective products. The founder, Natalie Franz, a makeup artist to Lady Gaga, Taylor Swift and Karl Lagerfeld, conceptualized the brand on a trip to Tokyo by observing how the eye lifting motion transformed her appearance instantly. The current line includes eyelid lifting stripes, six specifically targeted face masks, and under-eye collagen eye patches, all designed to deliver a youthful-looking appearance to the skin. All products are cruelty-free, paraben-free and dermatology tested, with the brand winning a Danish Beauty Award in 2016. The first product that was launched were the Eyelid lifting stripes that are composed of a skin-friendly silicone that instantaneously creates a fresh and radiant look, with a long-lasting effect, suitable for women and men of all ages. These invisible wfv patches generate a younger appearance to the skin, without hindering makeup application. These stripes create a surgery-like eye lift affect without plastic surgery or botox. The face masks range includes: a Lifting Collagen Mask, a Hyaluronic Intensive Treatment Mask, a Deep Detox Tightening Mask, a Chin & Cheek Lifting Mask, a Magnetic Youth Mask, and Hand Repairing Gloves. The Lifting Collagen Mask is infused primarily with collagen in combination with caffeine, vitamin C & E, macadamia nut oil, glycerin, and hydrogel to tighten the lower part of the neck to reduce the appearance of a double chin. Collagen is known to fight off wrinkles, however after age 25 the body’s collagen production decreases dramatically. The mask moisturizes the skin, improves blood circulation, and boosting the skin’s elasticity. The Hyaluronic Intensive Treatment Mask nourishes the skin with its gel type mask infused with hyaluronic acid. The acid is known to improve skin texture and providing a younger appearance. The mask treates the skin instantly fills and smoothes facial wrinkles, providing a cooling effect as it moisturizes to improve the skin’s elasticity. This product won a Danish Beauty Award in 2016. Capital & Commercial Ventures (CCV) has been sourcing products for international mail order catalogues since 1988. Because of our expertise, we are the U.S. buying office for several European catalogue houses. Our success in exporting American made goods has led us to expand our services to include unique products to U.S. mail order catalogues. CCV is also a distributor.